Now that the hive is done my friend Brad Nicholson comes over to help transfer the bees from their temporary hive to the new one. The swarm I caught has only been in there for a month but has already filled the frames I gave them as well as the rest of the empty space. Brad ties on extra piece of comb to an edge of the frame that has some free space. 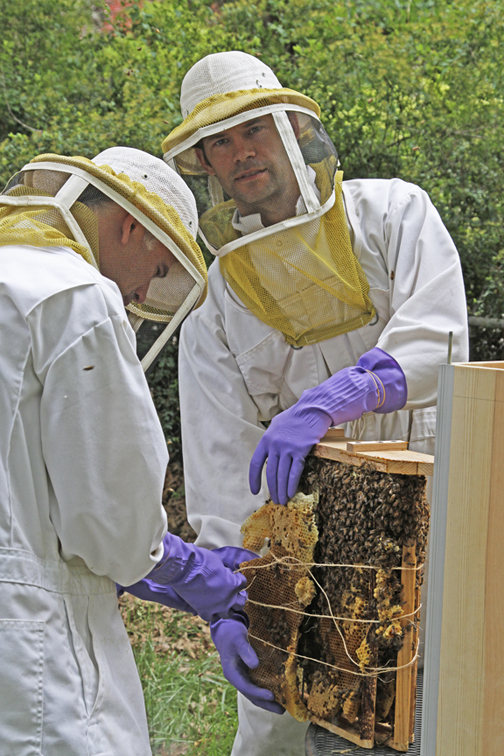 Later the bees will secure this with wax and remove the string themselves. I built the frames at a diagonal after noticing that the bees often build in this way when they don’t have any frames to guide them. There may be an advantage to having the largest comb right in the middle (especially in the winter when they need to form a cluster to keep warm). 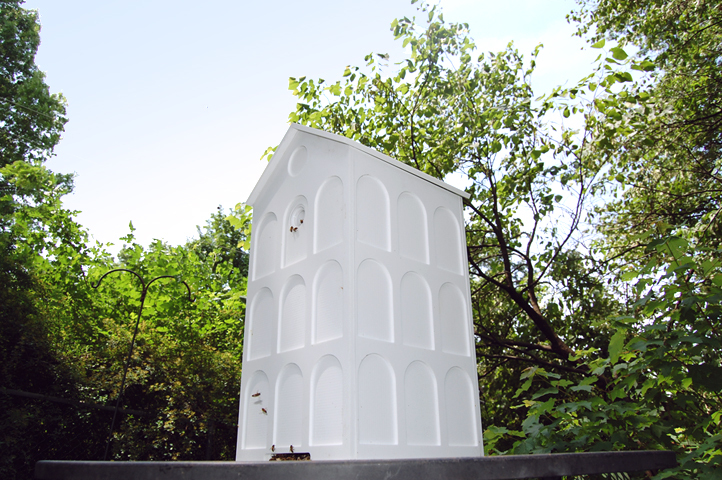 The bees are in their new home and ready for installation on the post. I have noticed that now that the weather is hot the bees are perched on their font porch fanning the fresh air through their hive. I held a thin piece of tissue paper near the bottom hole and could see it blowing away from the entrance and when I held it near the upper hole the draft sucked it it. 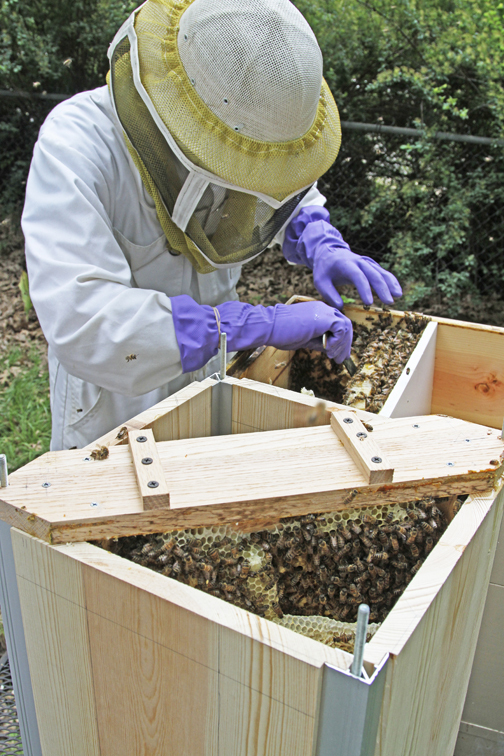 The double entrance seems to work well for circulating fresh air through the hive. 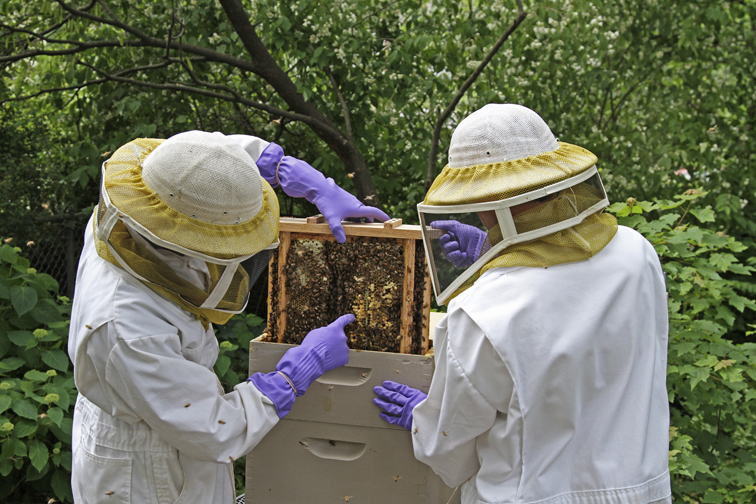 This should enable them to keep the hive cool in the summer as well as to keep the humidity they generate in the winter from building up and condensing inside the hive, causing moisture problems.